I too feel compelled to write a few words about President Hinckley. My first thought upon hearing the news was one of relief, I suppose. I thought it was nice that he had passed peacefully with out too much apparent suffering. I remembered the long illness of President Benson. I also thought of the happy reunion he must have had with his wife, as it was apparent that he missed her dearly. 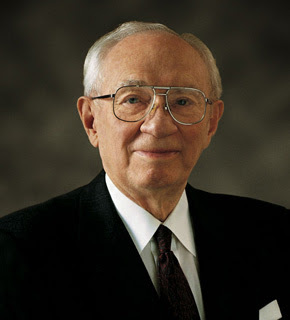 Later in the evening I was able to reflect upon the "good times" with President Hinckley, and the many times he made me smile, and the many times the spirit has testified to me of his calling as the prophet of the church. I then realized things will be different without him. I was privileged to be in his presence on a few occasions. The first being when he addressed our Married Stake at BYU in 96. I remember that Samantha was a baby (9 mo. ), and I got to the Marriott Center early to "get a good seat" because this was the first time Samantha would get to see the prophet, and I wanted her to see him. Of course she doesn't remember, but I do. I couldn't believe how accustomed the students were to being in the presence of the leaders of the church, that there really weren't that many at the meeting early to be in the presence of the prophet!! President Hinckley also attended the graduation ceremony when Brad graduated in 96, I remember because he walked right by where we were standing outside. I even snapped a pic. President Hinckley also dedicated the Montreal, Quebec temple in 2000, that we were also privileged to attend. There isn't a question in my mind that he was truly a prophet for this time, in this dispensation. You can read more information here, or here. There are so many good times with President Hinckley. You made me think of the times when I was at BYU and the times I was able to hear him speak. Even to this day, I am reverenced when I think of standing for the prophet when he enters a room. The crowd always goes so silent and you can feel the sanctity of his calling. A era has come and gone and we must more forward with anticipation in what the next prophet will lead us in.